D.C. Mayoral candidate, and Council Member Muriel Bowser gestures as she addresses her supporters at her election night watch party to await the Democrate Primary results in Washington, Tuesday, April 1, 2014. 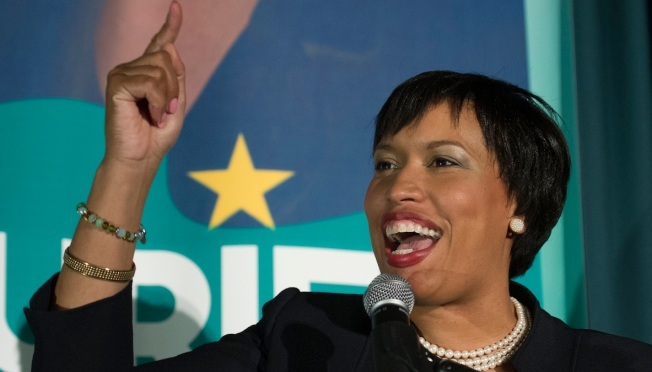 Muriel Bowser has built a big fundraising lead over her biggest rival as she seeks to become the District of Columbia's next mayor. Bowser's latest financial report shows that she raised $858,000 over a three-month period. Her campaign says she brought in $740,000 of that after April 1, when she defeated Mayor Vincent Gray in the Democratic primary. Three out of four registered voters in the District are Democrats, making Bowser the front-runner to win the general election in November. Fellow D.C. Councilmember David Catania raised $553,000 over the same stretch. He also spent more than $200,000, meaning he has $350,000 in cash on hand. Bowser has $720,000 in cash. Catania is an independent. Another independent, Carol Schwartz, announced her candidacy this week and has yet to start raising money.